Clermont Auvergne will go into their final Champions Cup Pool One game against Saracens in pole position after battling past Sale in soggy Salford. The French side led 6-3 at the break as Camille Lopez kicked two penalties to a solitary reply from Danny Cipriani. 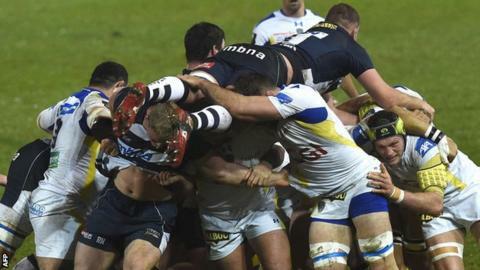 A converted penalty try put the hosts in front before two Lopez penalties saw Clermont regain the advantage. The lead changed twice more as Cipriani and then Lopez landed penalties, before Fritz Lee's try saw Clermont home. It was a fifth straight defeat for Sale and means Clermont will host Saracens in their final pool match on Saturday in a winner-takes-all clash to decide who tops the group. Cipriani, seeking to impress England coach Stuart Lancaster for one last time before the Six Nations squad is announced on Wednesday, showed his defensive prowess early on, denying Wesley Fofana a try. Clermont led moments later when fly-half Lopez kicked a penalty, but the visitors were dealt a blow when Aurelien Rougerie suffered an arm injury with Jonathan Davies coming on for him. Cipriani responded with a penalty but Sale also suffered an injury blow when former England winger Mark Cueto was replaced by Tom Arscott. Lopez edged his side ahead just before the break but it was the home side who scored the first try of the game after the break. Fofana and Jamie Cudmore were both sinbinned for Clermont but two Lopez penalties gave his side the advantage and although Cipriani restored Sale's lead with his third penalty in the 65th minute, Lopez then kicked his fifth penalty and Clermont's late scores secured the win. "We have lost at home to three sides - Saracens in the last minute, Munster in the last minute and we were beaten in the last 10 minutes today. "We've come a long way as a side in this competition but we've got a lot to do and a lot to work on. "It's good that we are playing against these kind of sides who are, week in and week out, probably better than us and we will learn from it. "We could have won this game and we just need to believe in ourselves a bit more." Sale: Haley; Addison, Leota, Tuitupou, Cueto; Cipriani, Cusiter; Harrison, Jones, Cobilas, Mills, Hines, Braid, Seymour, Beaumont. Replacements: MacLeod for Addison (34), Arscott for Cueto (24), Cliff for Cusiter (76), Lewis-Roberts for Harrison (70), Taylor for Jones (60), Easter for Mills (59), Lund for Seymour (66). Clermont Auvergne: Abendanon; Nakaitaci, Rougerie, Fofana, Nalaga; Lopez, Parra; Chaume, Kayser, Zirakashvili, Cudmore, Vahaamahina, Chouly, Bonnaire, Lee. Replacements: Davies for Rougerie (11), Debaty for Chaume (63), Jacquet for Cudmore (63). Not Used: Ulugia, Ric, Bardy, Radosavljevic, Delany. Sin Bin: Fofana (46), Cudmore (52).